As we head into winter, some of the best biking is still ahead of us, if you ride with fat tires on our many miles of groomed trails at Turpin Meadow Ranch or in the surrounding Tetons area. 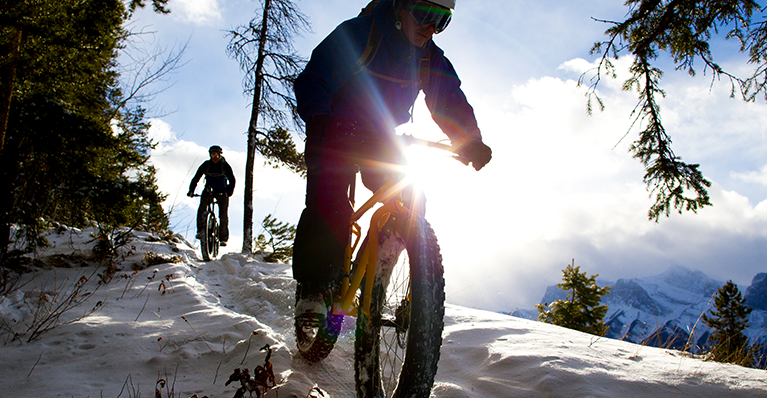 With the latest craze in big wheels, your biking season can be extended further, into wet stone, mud and snow. Whether you are new to the sport or have been riding for a while, here is the first in a series of tips we hope will be helpful when riding this winter. Wide tires: this may seem like a given, but if you are riding in deep snow, your tires should be wider than 3.5 inches, which is not always standard on fat bikes. Tire pressure: most of the time, it should be less than 10 PSI when riding primarily on snow. It’s advisable to bring a gauge and a hand pump, especially on sunny days or after a recent snowfall, to make adjustments on the trail as needed. Traction: you’ll most likely want enough traction that you are able to safely control your bike and not slip or skid while riding. Your bike pro should be able to help suggest good tires for deep snow and groomed trails, and if you can, maybe bring a couple of types if the conditions are varied. As far as clothing, dress similarly to how you would dress for other outdoor winter sports. Moisture wicking inner layers and waterproof outer layers are key. We have more tips about dressing for ranch weather in our related posts: Winter Must Have Items and This Winter, Make it Fat (Bike).